Jacob, or Israel, had twelve sons. Each son became the father of one of the twelve tribes of Israel. Before he died, Jacob called his sons together to give them his blessing. God gave him these words of blessing that foretold the future. Jacob’s blessing to Judah had special meaning: the Messiah would be born to the tribe of Judah. The genealogies of Jesus in Matthew (see 1:2-3) and Luke (see 3:33) include Judah’s name. God did not wait until the time for His Son to be born to find the right family for Him. He had been planning a family for His Son from the time of Abraham and Jacob and Judah, thousands of years before Jesus’ birth. Jacob’s words not only foretold that the Messiah would come from the tribe of Judah; they also foretold that He would be a ruler. 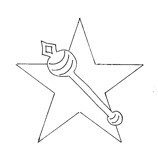 The symbol for ruler here is a scepter. A scepter is a rod, usually of gold and decorated with jewels, signifying the king’s authority, or right to rule. Only the king had the right to own and to hold a scepter. When Jacob said that the scepter would not depart from Judah, he was prophesying that Israel’s kings would come from the tribe of Judah. The first king of Israel in this tribe was David, another ancestor of Jesus. The tribe of Judah was to be the royal tribe of Israel until “he comes to whom it belongs.” The one to whom the scepter truly belongs is Jesus. Hebrews 1:8 describes the kingship God has established for His Son: “Your throne, O God, will last for ever and ever, and righteousness will be the scepter of your kingdom.” Jesus’ kingdom will last forever. Jacob’s prophecy says that “the obedience of the nations is his.” We can look forward to this part of the prophecy when “at the name of Jesus every knee should bow, in heaven and on earth and under the earth, and every tongue confess that Jesus Christ is Lord, to the glory of God the Father” (Philippians 2:10-11). At that time everyone all over the world will understand that Jesus is king. Thank God for the coming of Jesus, and the fact that He now reigns as King over God’s kingdom on earth. Ask God to help us to serve as faithful and loyal citizens of His kingdom. Thee shall I love in endless day.